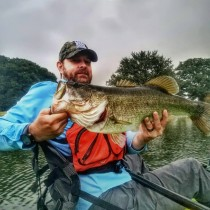 In my 11 years of kayak fishing, I've learned a lot. For most of it, I didn't have mentors and fishing forums that I could frequent. I was on my own, messing things up by trying to rig things, and getting good at patching holes. That first Pelican kayak (The Banana Boat), was something to get me on the water and did what it was supposed to. It was a sit in style kayak and I learned not once but twice that you can swamp them out and how dangerous summer storms can be. With all of these lessons, and a few extra bucks in my pocket from overpaying the IRS, I decided to upgrade. I found an amazing deal through a friend of a friend. He was selling an Ocean Kayak Venus and a Heritage Pro Fisherman 14. I had never been in either of these kayaks. I hadn't even heard of the models specifically. What to do? I decided to do a little research and did an internet search for both of them. I quickly realized the OK Venus was pink. Looks like my wife was getting a kayak. Everything I read about the Heritage was "great fishing platform", "fast kayak", "might have to rig something for a crate". I heard these same things over and over. The deal had to be done and at the price I was getting I bought them. Sight unseen. With no demo. 24 hours after I heard about the deal I picked up the kayaks. Wanting to play with my new toys I headed to the lake. Having come from a 10 foot long sit inside kayak, this new 14 foot sit on top was going to be awesome! Except, it wasn't. As soon as I pushed off from the shore I started to rock. It took everything I had to stay upright and not tip over. I paddled a little bit, struggling the whole time. I hated this kayak. 10 minutes after I started I wanted to get rid of it. My Pelican NEVER did this. A month after I bought the Heritage, I sold it. I failed to demo. The guy even offered to let me try it out. I refused because I knew other people were interested and didn't want to lose the deal. I was so anxious to get out of my old kayak I didn't check it out. What I discovered was that year model of the Pro Fisherman was 26" wide. Worse than that the side swept up and it had no secondary stability. The cockpit was narrow and there was no way to redistribute weight. The kayak's weight capacity was also 300 pounds. At that time in my life I was a doughy 225 on a slight 6'2" frame. Basically I jiggled when I moved which was a weight shift problem. That and the fact that water was coming through the scuppers. This was a bad move. Too many times people get excited about a good deal on a used kayak, buy into the marketing hype for a new kayak and don't make an informed decision. Looking at specs and getting the opinions of others is helpful but the true determinant for if a kayak is a good fit is sitting in it or on it and trying it out, in the water. If you can't demo, I understand but don't be surprised if you don't like the kayak. Is it possible to find a yak just by a catalog that you will enjoy? Sure. Well, sometimes. Do you want to get on the water so badly you'll risk $500 or $1000 or more? Not everywhere has kayak dealers, I understand that. Most places have folks within an hour that might be willing to meet up. It's your money and your choice but please at least be aware of what I'm trying to tell you. I made a BAD mistake. Try not to do the same.